Many military families plan trips to the Washington, D.C. area, especially if stationed nearby. While most people have monuments and museums on their mind, I recommend spending the day at the home of George and Martha Washington in nearby northern Virginia. The quaint plantation is less traveled than D.C.’s Mall area, but its peak season tourists are often coupled with students from surrounding schools and their scheduled field trips. Use these insider tips for unique knowledge and helpful suggestions to make the most of your time at this historic and charming home. Mount Vernon is open 365 days a year. Operating hours for the property, eateries, and gift shops vary from season to season. Plan for your arrival by reviewing the many activities, events, and special attractions at Mount Vernon’s website. It's very descriptive with lovely photography, and is designed for visitors to make the most of every moment on the estate. Sign up for emails from Mount Vernon prior to your visit for upcoming attractions with limited availability, such as the president’s annual Birthnight Supper and Ball. If you plan to visit more than once a year, consider purchasing a membership or annual pass. The savings add up quickly as do the perks, such as early ticket access and discounts at the gift shop and restaurant. Crowds are fewer in the colder months, and Mount Vernon often offers reduced pricing for off-season tickets. Spring and summer are beautiful with gardens in full bloom, but expect the heat and humidity to make an appearance. Fall is spectacular at Mount Vernon with breathtaking colors that frame the mansion and the Potomac River. The two main parking lots are free of charge, but they fill up quickly. Travel just beyond the traffic circle to find the parking lot shared with the post office. It's less visible and often has spaces available. All are a short, easy walk, but curb drop-offs are allowed. Dine at the Mount Vernon Inn, a restaurant inspired by food served during the days of the Washington’s residence. There's also a casual food court with burgers, pizza, and sandwiches. The gift shops are easily some of the best in all of the D.C. area museums. These outlets are open to the public without the price of admission. Mount Vernon’s Distillery and Gristmill site is just a couple miles away, but not walkable. This historic property will take about two hours to fully explore, complete with narrated tour. If the weather is agreeable, a picnic on the river bank is highly encouraged. Both the distillery and the gristmill are operating and produce grain flour and small batch distilled spirits. (George Washington was once the largest whiskey producer in America!) Limited quantities of whiskey and other spirits are sold in the gift shop. Due to the distilling schedule, they are only open to the public April through October. Military ceremonies such as promotions and retirements may be performed at Mount Vernon. The Fred W. Smith National Library for the Study of George Washington is located very near Mount Vernon, with access across the street. The scholarly research center is only available by appointment, however. President Washington loved dogs and raised many on the plantation. Mount Vernon is dog friendly. They may enter the gates on leashes, but must remain out of all the buildings. 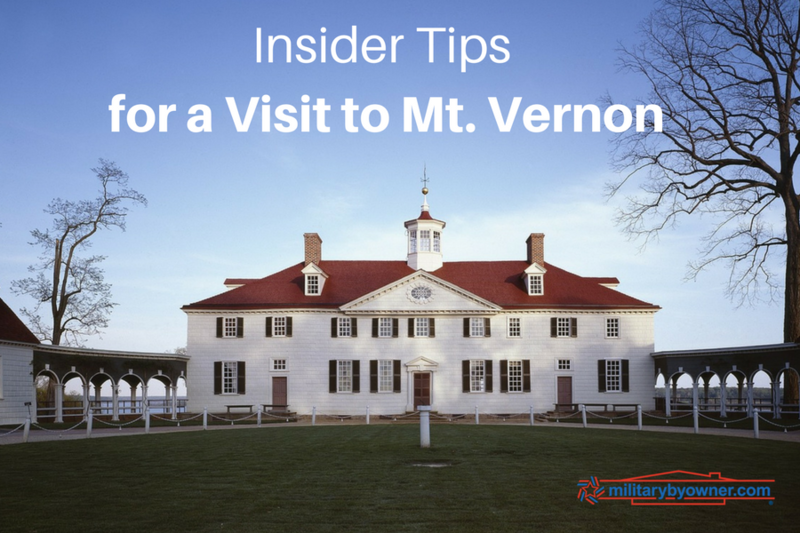 Fort Belvoir is a vast Army base located just beyond Mount Vernon by about five miles. Its availability may be useful for vacation lodging and emergency medical care for military families. Fort Belvoir also provides access to an expansive and new Exchange, a commissary, several shoppettes, and MWR for cost-cutting expenses.